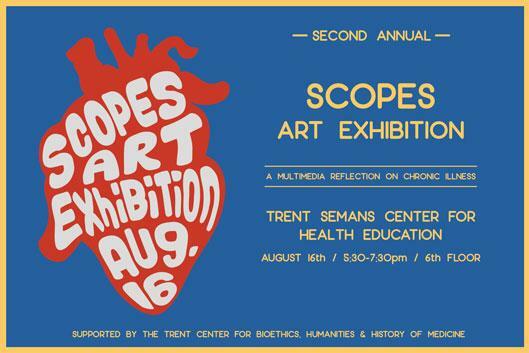 Scopes is a student-led initiative that is committed to integrating the arts and humanities into medical education at Duke. Scopes provides first-year medical students with an opportunity to consider the experiences of patients through creative forms and media, such as photography, film, writing, visual arts, music, and beyond. Join us for the showcase of the final works. Free parking is available in the underground Bryan Research Building Parking Garage on Research Drive 4:30-8:30pm. The Trent Semans Center is directly across the circle from the garage. From the entrance, take the elevator to the 6th floor.